Who should play the parts in the Overnight Sensation movie? 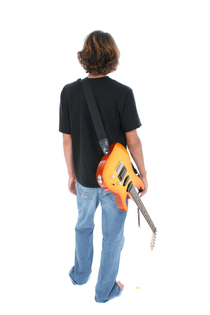 When writing the book, it helped to visualize who I thought could play the character's parts in the movie version. Yeah, I know, I'm jumping the gun here, but actually, I've had a few people express interest in turning Overnight Sensation into a theatrical release. 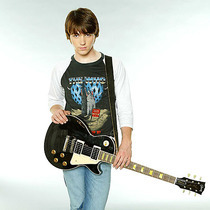 So... for Jonah, I imagined Drake Bell. At least, in this picture he looks like how I invisioned Jonah would be. Want to see who would play the other characters? A big thank you to The Indie Spotlight for featuring OVERNIGHT SENSATION today including an interview! Thanks for the plug guys! My Visit to Taylor Road Middle School! What a fantastic night at Taylor Road Middle School! I was invited to speak at their annual "Tangents Literary Soiree" last night to a packed house of at least 200 students, teachers, and parents and got to see some extremely talented 6th, 7th, and 8th graders read their original works. I have to say that the level of talent there is amazing as we were first treated to wonderful flute choir, followed by the authors themselves who were judged to be the best of the best at Taylor Road Middle School and let me tell you, they proved it last night. Then it was my turn, and after grabbing my oversized, stand-up the lead character in Overnight Sensation, 15 year-old Jonah Levine, (see above pic), I talked to the crowd about what it's like being an author and how no matter what obsticles may get in your path: time contraints, self doubt, procrastination, if writing is something you desire to do, don't give up. I also talked about being able to take a compliment as well as a hit, because once you put your writing out there, you've got to realize that not everyone is going to like it. But that's not why we writers write...right? We write because we love doing it and as long as you persue that passion, you'll be okay. 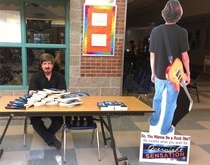 Then I showed the Overnight Sensation book trailer and signed some books to some great students. Thanks again to Taylor Road Middle School for having me. It was an honor and I greatly appreciate having been a part of your evening!